Why does the Onei MK-I Halo Ceramic Flat Iron Work So Well When it comes to Straightening Curly Hair? You may be wondering if there is an easier way to straighten your curly hair. It’s not uncommon for many to become frustrated when trying to straighten this sometimes stubborn hair type. Some of the problems you are experiencing straightening your short hair may be due to your technique but more than likely you are simply using the wrong flat iron to do the job efficiently. 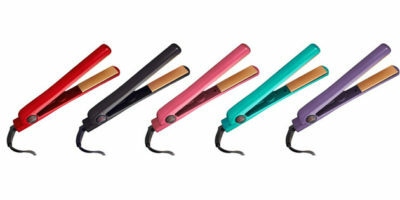 One flat iron model that we are told works well on curly hair is the Onei MK-I Halo Ceramic Flat Iron. That is why we decided to write a review on it and see if it works as well at straightening short hair as people say. This flat iron is loaded with nice features. Among these is its very generous amount of heat choices. With its easy to use digital temperature selection you can choose aq heat setting anywhere from 150°F – 450°F It also has a ceramic heat plate coating. This ensures this flat iron will be ready to use in no time and it will stay at the desired operating temperature while using it. Its one-inch wide heater plate width adds a nice bonus when straightening curly hair too. That’s because this is a very versatile heat plate width. It can be used on all lengths of curly hair without a problem. The digital controls on this flat iron make it very easy to set the temperature and read out where the temperature on it is currently at. It has nicely contoured edges all the way around its heat plates so you will experience every little tugging on your curly hair as you slide it across its heat plates. 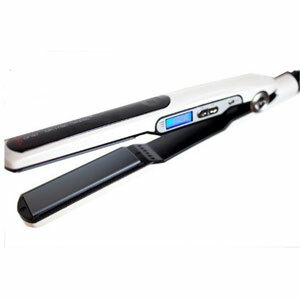 This flat iron model comes with a salon length power cord with attached swivel end. You get a lot of freedom of movement when using it. 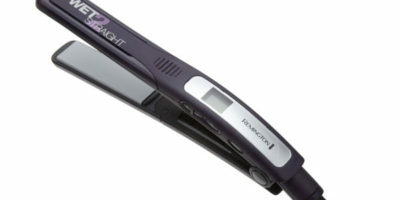 It also is a dual voltage capable flat iron. That means you can take it with you and use it anywhere you travel in the world. 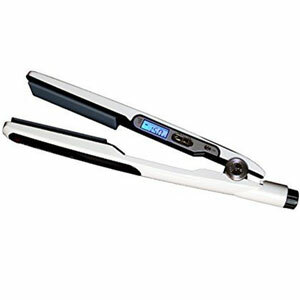 The Onei MK-I Halo Ceramic Flat Iron will also conveniently shut itself down after 1-hour of non-use. It also weighs just over 1-pound so arm fatigue is not an issue when using it. One of the things that make this flat iron very effective at straightening curly hair is its wide variety of heat choices. Its 450°F max heat is high enough to get even the most stubborn strands of curly hair to straighten out. Another thing that makes this flat iron great for use on curly hair is its floating heat plate design. Curly hair tends to need all the heat you can put on it in order to straighten it. Since the Onei MK-I Halo Ceramic Flat Iron’s heat plates are made with a floating design it keeps your hair on the hot plates longer which makes this flat iron more effective at straightening curly hair. The warranty you get when you purchase the Onei MK-I Halo Ceramic Flat Iron is on par with the industry standard for its price range. You are covered after purchase for a period of 2-years. We did find fault with a couple things relating to its thicker body design too. For one some people find it has a bulky feeling when they are using it to straighten their hair. Its thicker body design also makes it nearly impossible to use this hair straightening tool to curl hair with also. This is a somewhat basic but very effective flat iron to use for straightening curly hair. Part of its appeal is its simplicity when you go to straighten your curly hair with it. It has a wide range of temperature setting choices and its rapid heating ceramic plate coating is a nice bonus you get with it too. The Onei MK-I Halo Ceramic Flat Iron is very safe to use and can even go with you as you travel around the world thanks to its dual voltage design. If you truly want to make straightening your curly hair easier than you should definitely consider purchasing this flat iron model.